Discussion in 'The Lounge' started by stoney, Dec 10, 2012. This whole owning a home thing is pretty sweet until stuff starts breaking. For example, my garbage disposal stopped working today. That is going to make for a fun repair, but the sink still works. Back in October, the closet shelving in the master bedroom decided to detach itself from the wall. It was nothing special, just your standard 12" wide board with a dowel bar to hang clothes from. Wifey and I decided that we should upgrade the closet, because there is no point to replace it cheaply, if we will eventually want something with more storage space. We looked at getting a custom closet put in, but I'm too cheap and felt I could do something nicer myself. While we were researching what to put in, I came across this link: http://diydiva.net/2011/05/when-your-closet-is-nicer-than-your-living-space/ I really liked the look, as did Wifey, so I set to designing the closet. Once we got all of our clothes out of the closet, the damage was pretty bad. When the shelf collapsed, it gouged the wall really bad. The shelf also had a very poor silicon job against the back edge, which was going to need additional repair work. I had to take the two shelves off the back wall too, which conveniently had large holes behind the back boards. The paint and orange-peel texture were also done over the shelving, so large areas of the wall had to be fixed. Setting up the layout for the closet was another task though. Using galvanized steel for the framing meant that I needed to map out my goal before I could even start. Initially, I had planned on have 12" wide shelves immediately inside the door, two hanging bars over one another, a full height hanging bar, shelves in the corner to match the first set, then another double hanging bar. Upon acquiring the necessary piping to start my mock-up, I came into a serious problem - counter-threading. More appropriately, the lack thereof. This ended that plan. After trying a few other options, I decided to have shelves the full length of the closet to half height with hanging racks above then. I was still planning on making a turn with the shelving at the back wall, then stopping mid-wall for a full hanging rack space. Seeing how this was a much better plan, I acquired the remaining piping I needed and decided on Poplar wood for the shelving. The light color would help keep the room bright, and Wifey liked the wood color. While boards were setting, I cleaned up the walls in the closet. I removed the extra silicone, patched all of the holes, sprayed everything with orange-peel texture, and painted it "arctic white". That also took a shockingly large amount of time, given the number of trips to Home Depot I was taking. It doesn't look large, but it's an 8' x 4' closet. The shelves are 14" deep, spaced 6", 6", 12", 12". Plenty of shoe space on the lower shelves, and room for the clothes she folds in the other shelves. There are three sections, the first two are the same width. I added another bar across the top to connect to the opposite wall for additional hanging space. Wifey liked the space she got from this, so I didn't have to build out the connecting shelves along the back wall. If she wants more shelves, I will just add more shelves in the back left corner. I get the section closest to the door. All of my clothes hanging and folded up will fit in that section. I am to be left one drawer for socks and such. This leaves Wifey with three full sized dressers and the rest of the closet... And the scary part is that she pared down by easily 30% when we moved to CO. 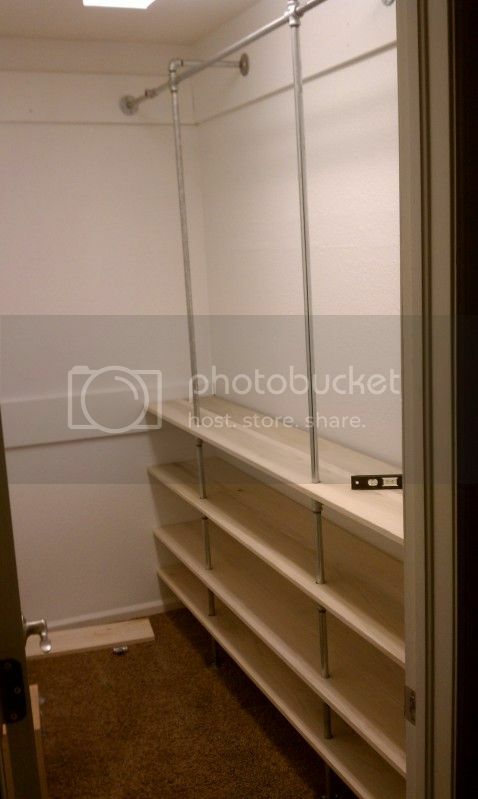 Either way, we were looking at $1500-2000 for a fancy custom built closet. This only cost us $700 and should last forever. I know I should have taken more pictures, but it was not high on my priority list while tearing down and building. But yeah, that's been my project for the last 2.5 months. TL;DR: Closet shelving collapsed, built a new closet. While you 'spent' a lot of your own time the closet systems tend to be total crap for the price. FYI, a real lumberyard (not a big box) can get you any species/dimension wood you want. Did Stoney just come out of the closet? Stoney, make sure you hit the reset button on the bottom of your garbage disposal before calling someone out to fix it. I tried a few large yards, but for my scale it was prohibitively expensive. The wood was $300 as is, it would have been over $500. I have more time than money, so I'd prefer that option. Good to know. The guy at Home Depot told me to try spinning the allen at the bottom to make sure the blade still spins. The power actually comes on and the motor works. The blade is not spinning though. ah different problem then. between the reset button and allen key fixes, i've exhausted my knowledge of garbage disposals. good luck with yours. I've acknowledged that I am likely buying a new one. This whole owning a home thing is pretty sweet until stuff starts breaking. If it's a "newer" type disposal they are really easy to change. If it's an "older" type disposal... good luck finding a new sink. Newer type, from what I can tell. That's good news. Old one should just "unbuckle" from the flange... buckle the new one in... off to the races. When ours took a dump, I had it removed and replaced in about an hour. Easy-peasy. It took longer to drive back and forth to Home Repot and pick one out. This. I'm deciding on whether to do the $200 quiet one, or the $85 loud as all hell version. The sleeping baby makes me think the more expensive model. never used a garbage disposal. that was the dogs job. Nice. How do you like the shelves? I've been thinking about building some similar ones in my office. I was happy to see the Brick House post on them so that I can use their experimentation instead of wasting my own time. However I was slightly disappointed that they're not going to be as unique as I'd hoped. Get the cheap one. Don't run it when the baby is sleeping. Spend $115 on booze so the wife can't repossess the extra $$. The one I bought has life time warranty might want to check your model? I don't know how old the one I replaced was (it came with the house), but even the $90~ish one i put in was WAY more quiet then the old one. I'm glad I didn't spend the extra dough.